Summary: We describe the case of a 28-year-old obtunded woman who presented with bilateral anterior parietal lobe cortical hemorrhages associated with thrombosis of the superior sagittal sinus, both transverse and sigmoid sinuses, and multiple cortical veins draining into the sagittal sinus. Initial heparin therapy was not effective. A combination of AngioJet rheolytic catheter thrombectomy, balloon angioplasty, and continuous direct superior sagittal sinus recombinant tissue plasminogen activator infusion led to venous recanalization with a successful clinical outcome, without worsening of the preexisting intracranial hemorrhages. Case series and case reports have described a variety of treatments for dural sinus occlusive disease. There have been reports of successful outcome following treatments with heparin, low molecular weight heparinoids, direct dural sinus infusion of pharmacologic thrombolytic drugs, and mechanical thrombectomy using balloon angioplasty or rheolytic thrombectomy devices. We will discuss these individual therapies that have been reported in the literature. In the case presented, a combination of all of the above techniques was necessary to achieve angiographic and clinical success. The patient was a previously healthy 28-year-old woman with a 1-month history of blurry vision and headache. Ophthalmologic examination 2 weeks before admission demonstrated bilateral papilledema. On the day of admission to an outside hospital, she awoke with numbness of her left face, arm, and leg. At 4:00 a.m. that day, she presented to the local emergency room. By later that morning, she had weakness of all extremities, speech difficulties, and disorientation to person, place, and time. She was agitated, could not follow commands and would only withdraw to pain (Glasgow coma scale 8). She was then transferred to our institution. Initial noncontrast CT showed bilateral anterior parietal lobe hemorrhagic infarctions. An MR venographic (MRV) examination demonstrated diffuse dural venous sinus thrombosis involving the superior sagittal sinus, straight sinus, and transverse and sigmoid sinuses bilaterally. 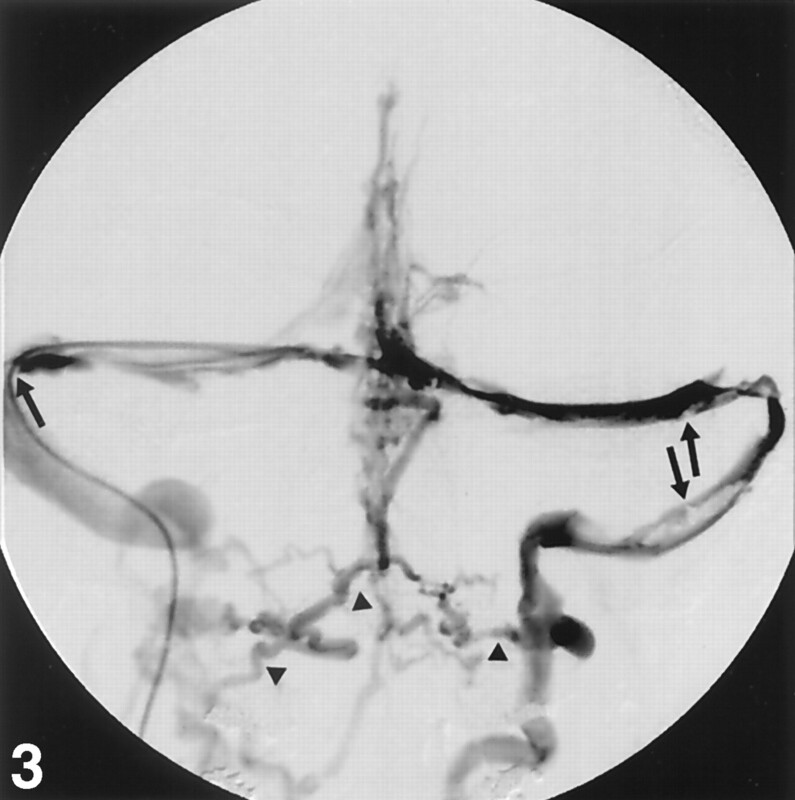 Extension of thrombus into multiple cortical veins draining into the sagittal sinus was also noted. MR images showed subacute bilateral anterior parietal infarcts with petechial hemorrhagic components, similar to the CT findings. She was admitted to the neurointensive care unit, and heparin therapy was initiated. Because of her lack of clinical improvement after 40 hours of intravenous heparin therapy, she was referred for endovascular therapy. Consent was obtained from family members. The patient was sedated and had already undergone endotracheal intubation. An 8F shuttle (Cook, Bloomington, IN) 90-cm sheath was placed via the right femoral vein with its tip slightly below the right jugular bulb. A 135-cm Turbo Tracker 18 catheter (Boston Scientific, Natick, MA) and a 150-cm 0.018-inch Terumo glidewire gold were navigated into the superior sagittal sinus; gentle contrast injection showed minimal venous outflow directed anteriorly (retrograde to normal flow direction) and extensive clot filling the superior sagittal sinus. A 135-cm 4F AngioJet catheter (Possis Medical, Minneapolis, MN) was navigated over a 0.14-inch ACS Hi-Torque Extrasport 300-cm exchange wire (Advanced Cardiovascular Systems, Temecula, CA) into the superior sagittal sinus. With the Possis Rheolytic thrombectomy system engaged, the AngioJet catheter was withdrawn to the right jugular bulb and then readvanced to the superior sagittal sinus (Fig 1). Venography performed via the AngioJet catheter port showed improved patency of the superior sagittal and right transverse sinuses, with slow antegrade flow, although there was still considerable clot remaining (Fig 2). The Tracker 18 catheter and 0.18-inch glide gold wire, were used to cross the midline and catheterize of the thrombosed left transverse and sigmoid sinuses. Over the exchange wire, the 4F AngioJet catheter was positioned within the left sigmoid sinus near the left jugular bulb, withdrawn to the midline, and then once again advanced with Rheolytic thrombectomy performed on both passes. A 120-cm, 5 mm × 20 mm Slalom angioplasty balloon (Cordis, Miami Lakes, FL) was inflated to 3–4 atm in the mid to distal right transverse sinus, the area of most focal remaining thrombotic stenosis. 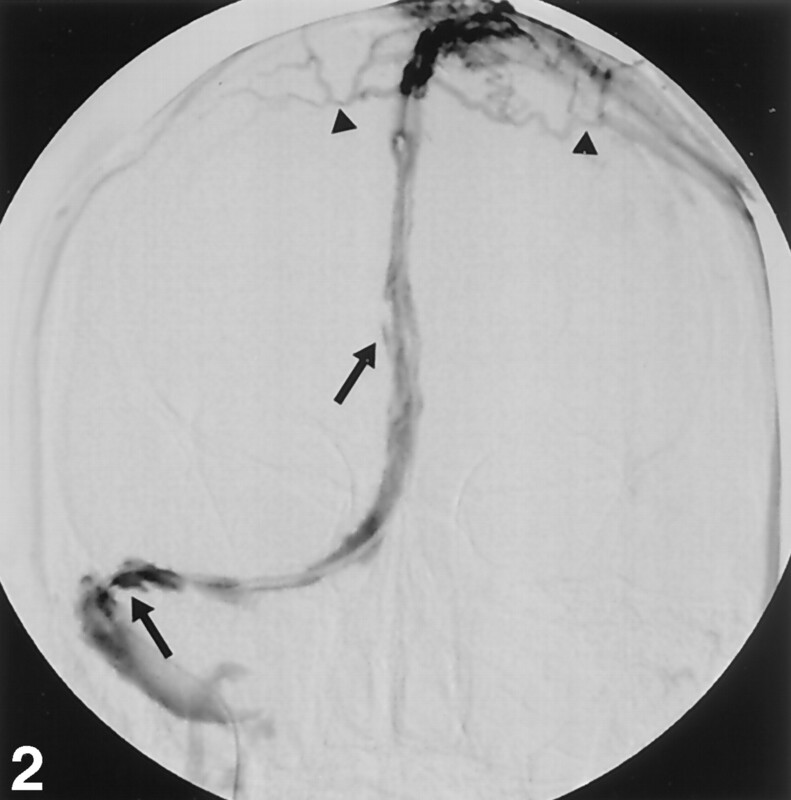 There was no attempt to use the balloon as a “Fogarty” balloon, to withdraw the thrombus proximally. Check venography via the Tracker catheter in the superior sagittal sinus showed slow antegrade flow and considerable thrombus remaining within the superior sagittal sinus and both transverse and both sigmoid sinuses (Fig 3). Continuous infusion thrombolytic therapy was initiated with the tip of the Tracker in the midportion of the superior sagittal sinus at a rate of 0.3 mg/h of Alteplase (rtPA; Genentech, South San Francisco, CA). Lateral projection skull radiograph shows the tip of the guidewire (arrowhead) extending distal to the tip of the AngioJet catheter (arrow). 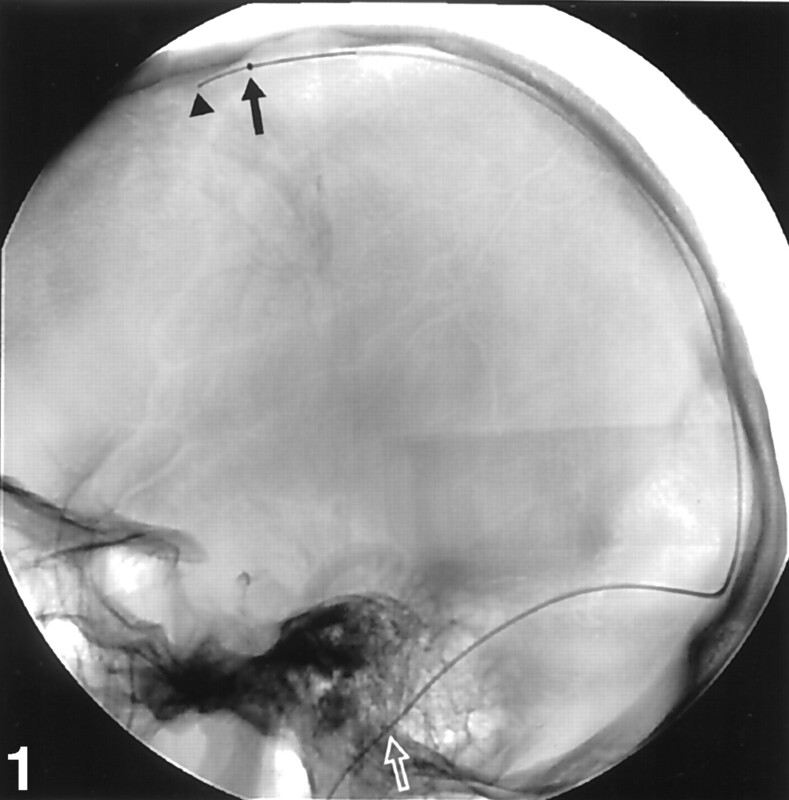 From this location, the AngioJet catheter was withdrawn over the guidewire to the right jugular bulb (open arrow) while engaged in rheolytic thrombectomy. Anteroposterior projection superior sagittal sinus venogram obtained via the AngioJet catheter port shows considerable improvement with sinus patency. Extensive filling defects from residual thrombus are present in the superior sagittal, right transverse, and right sigmoid sinuses (arrows). In real time, the antegrade flow was subjectively slow. Transosseous collateral veins are also seen (arrowhead). 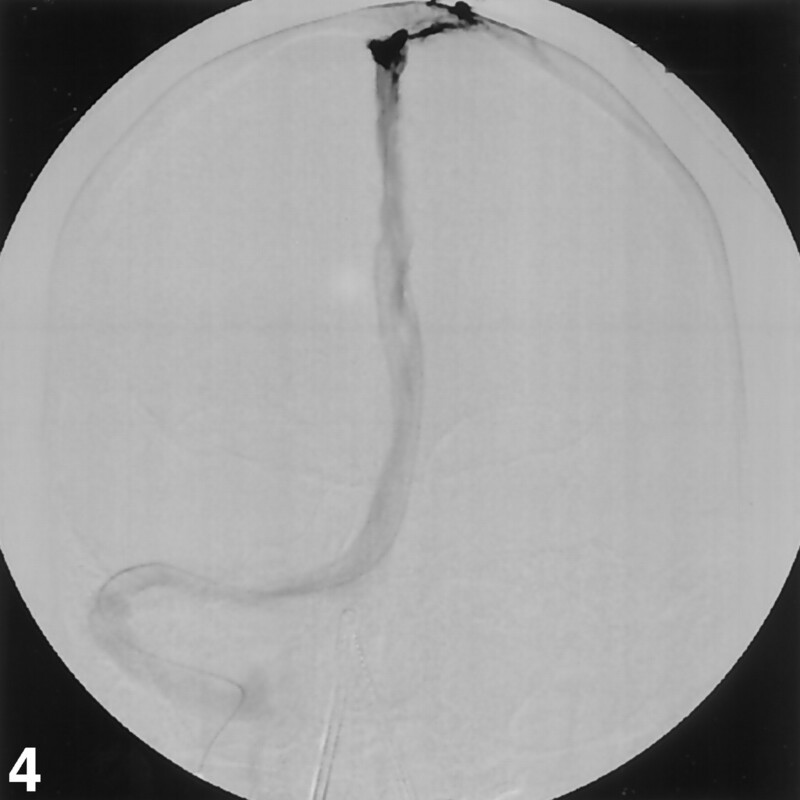 Anteroposterior projection venogram obtained after rheolytic thrombectomy and while the AngioJet catheter was withdrawn from the left to the right jugular bulb. Multiple filling defects, representing considerable residual thrombus, are seen in both transverse and sigmoid sinuses (arrows). Prominent collateral veins (arrowheads) in the posterior neck are seen aiding venous drainage of the posterior fossa. Repeat superior sagittal sinus venography after 15 hours of rtPA infusion showed that the clot had reaccumulated within the previously partly recanalized superior sagittal, transverse and sigmoid sinuses, with no antegrade flow seen. Unfortunately, we had expended our supply of the more navigable 4F AngioJet catheters. The 5F Possis catheter system could not be navigated into the anterior or middle thirds of the superior sagittal sinus, nor could it be navigated across the midline into the left transverse sinus. Thus, a 5F AngioJet 140-cm-long catheter was navigated via the right sigmoid and transverse sinuses to lie within the posterior third of the superior sagittal sinus. Rheolytic mechanical thrombectomy using three passes was employed. Check venography via the AngioJet catheter showed patency of the posterior third of the superior sagittal sinus, as well as the right transverse and right sigmoid sinuses. There was no reflux into the more anterior portion of the superior sagittal sinus, nor was there any flow in the left transverse sinus. A 4F, 4 mm × 2 cm Symmetry 135-cm angioplasty balloon (Boston Scientific/Meditech, Watertown, MA) was used to macerate the remaining clot. Check venography showed patent superior sagittal sinus, right transverse, and right sigmoid sinuses with residual clot. A continuous infusion of rtPA at a higher dose of 0.45 mg/h was instituted via a microcatheter catheter positioned in the midportion of the superior sagittal sinus, and the patient’s systemic heparin therapy was continued. After 22 additional hours of rtPA infusion, digital subtraction venography showed the superior sagittal, right transverse, and right sigmoid sinuses to be widely patent (Fig 4). The nondominant left transverse and sigmoid sinuses remained occluded. The catheters were removed, and the patient’s intravenous heparin was continued. She did not have any worsening of her parenchymal hemorrhages. Final anteroposterior venogram obtained on day 3 of endovascular therapy, following completion of mechanical intervention and rtPA infusion shows satisfactory antegrade flow and patency of the superior sagittal sinus, right transverse, and sigmoid sinuses. The nondominant left transverse and sigmoid sinuses remain occluded. The patient’s clinical course was complicated by respiratory failure requiring ventilator support, thought to be due to aspiration pneumonia. Her hemoglobin level remained stable at approximately 11 g before and during the 2 days of AngioJet treatment. Over the next 2 days, her hemoglobin declined from 11.2 to 7.9 g, necessitating red blood cell transfusion. The AngioJet device aspirates a volume of blood and clot. Although it replaces that volume with saline, it can also produce transient hemolysis (1). Our patient, however, had no evidence of hemolysis and no gastrointestinal bleeding at that time, and whole-body CT did not demonstrate a bleeding site. We theorize that the anemia was due to a phlebotomy and hemodilution effect of the Angiojet catheter. She was discharged 14 days later on oral warfarin with a normal neurologic examination. On her 6-month follow-up examination, she was neurologically normal without any deficit. MRV demonstrated patency of the superior sagittal, right transverse, and sigmoid sinuses, similar to the final postprocedural contrast-enhanced venogram. Over the months that followed, it was discovered that the patient had several risk factors for dural sinus thrombosis (2–4). She was found to have antiphospholipid antibody syndrome with lupus anticoagulant and was discovered to have ulcerative colitis and experienced lower extremity deep venous thrombosis. Dural sinus thrombosis is a disorder that is challenging to diagnose and treat. Diagnostic difficulty is in large part a result of the wide variety of clinical manifestations of this disorder. Dural sinus occlusive disease can be included in the differential diagnosis of scores of neurologic signs and symptoms from headache, visual difficulties, seizures, stroke, coma, and others (5). Many risk factors have been identified (2–4, 6–8), but many of these factors, such as oral contraceptive use and pregnancy, occur so commonly that their presence does not necessarily help in patient selection or triage. Conversely, less commonly occurring risk factors, such as antiphospholipid antibody syndrome and other hypercoagulable states, are usually undiagnosed before the clinical presentation of dural sinus thrombosis. Although the diagnosis of dural venous thrombosis is facilitated by the proper use of modern noninvasive diagnostic techniques including MR imaging, MRV, and CT angiography (9), the selection of patients who should undergo these examinations is often challenging. The adequacy of venous collaterals is the key determinant of the fate of the cerebral parenchyma normally drained by the newly occluded dural sinus or cortical vein. If a patient has partial occlusion of dural sinus outflow, the regional increase in the outflow venous pressure will be less severe than if there is complete venous outflow obstruction. This physiological concept relating intraparenchymal and intracranial pressure to the adequacy venous of outflow is logical and was well demonstrated experimentally in a swine model by Fries et al (10), in what they termed the “multistep process of sinus-vein thrombosis.” In that study, animals with experimental partial or complete superior sagittal sinus occlusion, without cortical venous blockage, did well without any significant increase in intracranial pressure or histologic abnormality after a few hours of occlusion. Animals with complete occlusion of the superior sagittal sinus and adjacent cortical venous thrombosis demonstrated significantly increased intracranial pressure, diminished cerebral perfusion pressure, gross evidence of petechial hemorrhage and blood brain–barrier disruption. Microscopically, there was evidence of edematous parenchyma with swollen perivascular astrocytes and perivascular hemorrhage. This complex process is reflected clinically, with some patients having only mild neurologic symptoms and good outcome, and those (presumably with poorer venous outflow) having more severe symptoms and bad outcome. The current diagnostic dilemma is the development of a reliable method to assess the adequacy of venous outflow in a given patient at the time of presentation to allow the treating physician to predict which patients have insufficient collaterals and will worsen without aggressive treatment. Our patient had 1 month of mild symptoms, presumably due to the presence of sufficient venous collaterals, with an abrupt decline when the collateral reserve was lost. The treatment for dural sinus thrombosis has classically consisted of anticoagulation with intravenous heparin and has been based on a 1991 article by Einhäupl et al (11), which reported the results of a randomized trial of 60 patients and demonstrated a strong benefit in patients treated with heparin versus placebo. The efficacy of heparin as opposed to placebo was so great that the trial was stopped after only 20 patients were enrolled. More recently, de Brijin et al (12) compared 30 patients treated with low-molecular-weight heparin followed by warfarin oral anticoagulant with 29 placebo-treated patients. Although the heparin and warfarin treated patients had a more favorable outcome and fewer deaths than did the control subjects, the differences were not statistically significant. At 12 weeks, in the treatment group of this study, 12% were cured without any residual deficit, 90% had no limitations of daily living, 7% were dead, and 7% had a poor outcome defined as Oxford handicap scale of 3–5 (12). In the placebo group, 28% were cured without any residual deficit, 79% had no limitations of daily living, 14% were dead, and 7% had a poor outcome defined as Oxford handicap scale of 3–5. Frey et al (13) reported on 12 patients treated with a combination of direct intrathrombus rtPA and intravenous heparin. Half of the patients had preexisting brain parenchymal hemorrhages. They used rtPA infusion doses of 1–2 mg/h and had complete flow restoration in six, incomplete flow restoration in three, and no flow restoration in three. Of those patients with complete flow restoration, five of six had a complete recovery. Of those with incomplete flow restoration, two of three had a complete recovery. Of the patients without flow restoration, no patients had a complete recovery, but all three did show some improvement and were functionally independent at 6 months. In two of three patients without flow restoration, there was worsening of preexisting brain parenchymal hemorrhage. Both patients had larger baseline hemorrhages than the rest, in the range of 14–23 mL. Our patient had 1 month of headaches and blurry vision before her abrupt decline, which manifested as complete obtundation. Following 40 hours of therapeutic (PTT 60–80 seconds) IV heparin, she did not show any clinical improvement. In light of her brain parenchymal hemorrhages, our initial plan was to use mechanical thrombolysis (14, 15) and venous angioplasty (16) to diminish the risk of worsening of her parenchymal hemorrhages. The Possis AngioJet system aspirates thrombus via creation of a vacuum using the Bernoulli effect. The disposable catheter is attached to a roller pump mounted in a large wheel-mounted driving unit. High-pressure pulsatile flow to six saline jets within the catheter creates low-pressure suction, which is used to aspirate the clot fragments into a collection bag via the effluent lumen of the catheter. There are several sizes of AngioJet catheters that can be used with the drive system and roller pump, including 4F 135-cm, 5F 140-cm, and 6F 120-cm catheters designed to go over a 0.014-inch guidewire. The AngioJet catheter injects saline and aspirates an isovolumetric quantity of blood and clot into a collection bag. The manufacturer of the device recommends that a maximum volume of 200–600 mL be aspirated into the collection bag depending on the catheter diameter and whether the treated vessel is occluded or in a flowing blood field. When we reached the maximum recommended level on the first day of treatment, the thrombectomy effect was judged insufficient. We continued the rheolytic thrombectomy to a more desirable angiographic result. On the initial day of AngioJet treatment, we aspirated more than 500 mL but less than the 1-L capacity of the collection bag. The volume of blood removed with this device is estimated by the manufacture to be about one-half the volume of the aspirate. This cannot be known in an individual patient, however, in light of the unknown ratio of clot to normal blood volume that will be aspirated. Logically, if the device is 100% efficient in aspirating thrombus, there will be no phlebotomy effect, and if the device cannot aspirate a given clot, all of the return aspirate will be nonclotted blood and injected saline. Hydraulic percutaneous mechanical thrombectomy recirculation devices, such as the AngioJet, can cause transient hemolysis, which is usually clinically well tolerated (17). In our patient, 2 U of packed red cells were given because of a decline in hematocrit. We theorize that her blood loss was due to the aspiration of blood by the throbectomy catheter. There was no detectible hemolysis, no evidence of GI bleeding, and no evidence of internal bleeding on whole-body CT scanning. Previous reports of rtPA (Altepase) used to treat dural sinus thrombosis have documented higher doses than we employed. The total dose given to our patient was 14.4 mg rtPA over a 2-day period. Kim and Suh (18) used 60 mg over the first 3 hours then 5 mg/h for a maximum total dose of 100 mg/day; total dose ranged from 50–300 mg. Frey et al (13) employed 1 mg/cm loading dose followed by 1–2 mg/h, mean total dose 46 mg. Yamini et al (19) used a 25-mg loading dose followed by 1 mg/min for 19 hours, for a total dose of 1165 mg. In making our treatment decisions in this case, we relied on prior reports of the use the AngioJet rheolytic thrombectomy catheter in the treatment of dural sinus thrombosis as a guide (14, 15, 20, 21). The AngioJet thrombectomy system and balloon angioplasty clot maceration resulted in restoration of partial patency of the superior sagittal, transverse, and sigmoid sinuses. The superior sagittal sinus venogram showed that antegrade flow within the sinuses was still relatively poor. We attributed this to the extensive thrombosis of cortical veins draining into the superior sagittal sinus and the logical conclusion that no vessel will stay patent if there is no inflow. At this juncture, we elected to add a continuous low dose infusion of 0.3 mg/h of Altepase (rt-PA) and systemic heparinization with a target PTT of 60–90 seconds. The lower dose was chosen because of the preexisting brain parenchymal hemorrhages. This was inadequate for recanalizing the cortical veins and maintaining patency of the dural sinuses. Partial patency of the superior sagittal, right transverse, and right sigmoid sinuses was achieved with repeat 5F Angiojet and balloon angioplasty, and a higher dose of rtPA (0.45 mg/h) was instituted again with systemic heparinization. Cross-sectional imaging (CT and MR) performed during the interval of the infusion demonstrated a decrease in the density of the cortical veins and dural sinuses, which suggests successful thrombolysis and recanalization, which was confirmed on the check venogram obtained the next day. The venogram demonstrated patency of the superior sagittal, right transverse, and sigmoid sinuses. The manifestations and outcome of dural sinus thrombosis are highly variable. Prior anticoagulation therapy trials of dural sinus thrombosis, case reports, and small case series of patients treated with mechanical and pharmacological thrombolysis offer some guidance in making therapeutic decisions for any given patient. Our case produced a successful clinical outcome but necessitated the combined use of rheolytic thrombectomy and balloon angioplasty on 2 consecutive days and direct intrathrombus pharmacological thrombolysis. Because no large-scale trial comparing therapeutic options exists, a variety and combination of management strategies may be employed in individualized clinical circumstances.